I don’t like this option because it means that statistics that have had little or no change will be updated. I could have a 10 million row table where only 1000 rows change, and yet the statistics for that table will update. This is a waste of resources. For a small database, or system that’s not 24×7, that isn’t such a big deal. But in a database with multiple 10 million row tables, it is a big deal. The sp_updatestats command isn’t a favorite of mine either. I’ve written about that here, so I won’t re-hash it. With this variation, we are updating index and column statistics, which is great. But…we are updating them regardless of whether it’s needed. Statistic with no rows modified? Update it. Statistic with 10 rows modified? Update it. There has always been an option to only update statistics that have changed, this is the @OnlyModifiedStatistics option, and this gets us behavior just like sp_updatestats. With this option, if no rows have changed, the statistic will not be updated. If one or more rows have changed, the statistic will be updated. Since the release of SP1 for 2012, this has been my only challenge with Ola’s scripts. 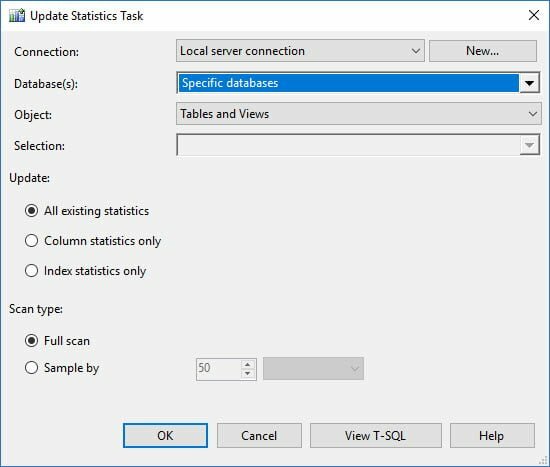 In SQL Server 2008R2 SP2 and SQL Server 2012 SP1 they introduced the sys.dm_db_stats_properties DMV, which tracks modifications for each statistic. I have written custom scripts to use this information to determine if stats should be updated, which I’ve talked about here. Jonathan has also modified Ola’s script for a few of our customers to look at sys.dm_db_stats_properties to determine if enough data had changed to update stats, and a long time ago we had emailed Ola to ask if he could include an option to set a threshold.� Good news, that option now exists! Take note: the option @OnlyModifiedStatistics option is not included here…you cannot use both options, it has to be one or the other. This will address fragmentation and update statistics for all tables in the SalesDB database except dbo.OrderStatus, and it will update statistics if 10% or more of the rows have changed. For the dbo.OrderStatus table, statistics would be updated when only 1% of the data had changed. I love the flexibility this provides! This is critical to understand because if the threshold I have set for @StatisticsModificationLevel ends up having a number of rows HIGHER than the formula above, statistics will update sooner than I expect. For example, if I have 1 million rows in a table and I have @StatisticsModificationLevel = 10, then 10% of the rows, or 100,000, have to change in order to update statistics. HOWEVER, if you plug 1 million into SQRT(1,000,000 * 1000), you get 31,623, which means Ola’s script will update statistics after 31,623 rows have changed…well before 100,000. This may be important for some of you to understand in terms of these thresholds, so I dropped the information into a table to make it easier to comprehend (at least, it’s easier for me!). Using my original example, if dbo.OrderStatus has about one million rows, then with 1% as the threshold, only 10,000 rows need to change before stats are updated. If the SQRT algorithm were used, over 30,000 rows would need to change before stats were updated, and depending on the data skew, that might be too high. Understand that as tables get larger, statistics will likely be updated before the set percentage value is reached because the SQRT algorithm has a lower threshold. (Yes, I’m driving this point home.) Consider a table with 10 million rows. If I set the threshold to 5%, I would expect statistics to update after 500,000 modifications, but in fact they will update after 100,000. If you’re wondering where the SQRT algorithm comes from, please review Microsoft’s Statistics documentation. This threshold was originally introduced with trace flag 2371 to lower the threshold for automatic updates. It is applied by default started in SQL Server 2016 when using compatibility level 130. My assumption is that Ola determined this was a good threshold to use as a fail-safe/catch-all for his script, and I think it was smart move on his part. In general, I’d rather have statistics update too often, rather than not often enough. However, using the new @StatisticsModificationLevel option gives us better control than we’ve had previously, unless we write a custom script (which is still an option…do what works best for you!). Can you force a plan for a different query with Query Store? Query plan with provided plan_id (2) is not found in the Query Store for query (4). Check the plan_id value and rerun the command. Within Query Store, the relationship between query_id and plan_id is managed internally (i.e. there are no foreign key constraints for the underlying tables), and there is a validation that any plan_id that you want to force for a query_id must have been generated for that specific query. In this type of scenario, you have to get the plan shape you want for the query, which may require trying different input parameters. The example I’ve provided is very simple, but when in doubt, check the input parameters for the plan that you want, then try those with the other query (that doesn’t yet have the plan you want to force). Of course, if you have to use a query or index hint to get the plan that you want, then it’s going to be a little trickier to get the plan you want for the original query. Good luck! When you enable Query Store, which is done with an ALTER DATABASE SET statement, the plan cache for the database is flushed. Now, before anyone writes up a UserVoice item, understand that there are several ALTER DATABASE SET commands that cause the plan cache for a database to be flushed. For example, taking a database OFFLINE causes the database plan cache to be flushed. That one seems intuitive, right? So why is the plan cache cleared when you enable Query Store, or change one of the settings? To ensure that new Query Store data is not lost. This relates to the internals of how Query Store works, which aren’t essential to dig into, the point is that this behavior is known by Microsoft and expected. Great, they’re there. Now enable Query Store, then check the plan cache again. The plan cache for the database has been cleared. Note that this only clears the plan cache for that database – plans for other databases still remain in cache. Run a few more queries to add some plans back to the plan cache, and confirm they’re there. This time, change one of the settings for Query Store. It’s already enabled, but perhaps we want to change the INTERVAL_LENGTH_MINUTES setting from the default of 60 minutes to 30 minutes. In checking the plan cache again, the ALTER DATABASE SET statement cleared the database’s cache. As you can see, the database plan cache is cleared after you enable Query Store, or change any settings related to Query Store. This is the same behavior we see with other ALTER DATABASE SET commands (e.g. changing the recovery model). Unfortunately, this is not documented, nor is anything written to the ERRORLOG. Of note: I don’t expect that you are changing settings often (if you are, I’d like to understand that thought process, as once you find the right values for space and interval, I expect those settings to be static…and if you’re not sure where to start, feel free to check out my post discussing the different options). I also don’t expect that you are turning Query Store on and off throughout the day; that completely defeats the purpose of the feature. It should be enabled, and left enabled, all the time. You don’t know when a problem might occur, right?